An expressive pair of drop-earrings from the Marisa Perry Light Drop collection featuring two North-South Bezel set Baguette diamond studs, each with four dangling Bezel set straight Baguettes that hang and fall straight down from the ear lobe. 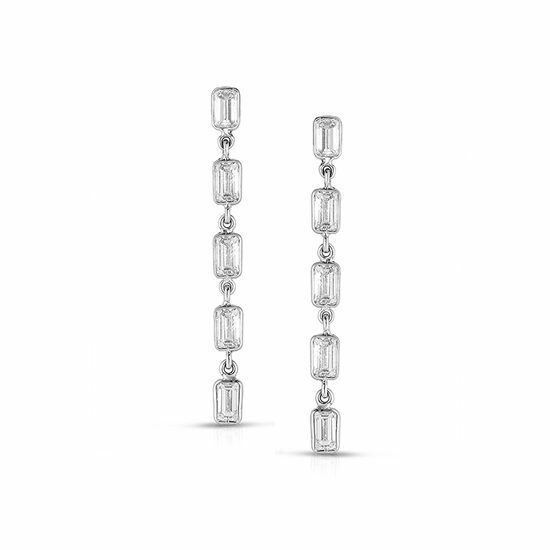 These earrings feature 2.18 carats of diamonds, set in 14k white gold. Diamonds catch the light and reflect it back better than any other material on earth. Our designer Douglas Elliott has created a fun series of Fashion earrings that capture light on the ear lobe and let you leave a little sparkle of light wherever you go.